A whiff of damp air hit Michael Donovan’s nostrils as he opened the door at the bottom of the basement stairs. The upper floors of the historic Graff Hotel in Marietta, Montana, had been expertly renovated. Rich dark wood walls and columns, coupled with sparkling crystal light fixtures and a gleaming marble floor, created a comfortable yet elegant ambiance. The narrow hallways and low ceilings of the basement, on the other hand, left something to be desired. But according to Bob, the chatty deskman, the basement was next on the renovation list, and the new and improved staff break room had already been relocated there. And that was where Michael would find Colleen. “An old friend?” The woman frowned at him as if debating whether to believe him. She wasn’t going to be as easy to convince as the guy manning the front desk. “I wanted to surprise her.” Actually, he’d wanted to meet her alone and convince her that he’d come in peace. He’d thought it would be easier to be alone in the basement than in the busy lobby, but no. He still had an audience, and a protective one at that. The small woman crossed her arms over her chest as a teenage kid a good head taller than her stepped out into the narrow hallway. “Yes. Collie,” he said. “She hasn’t gone by that recently.” He hadn’t called her Collie since her engagement to Garrett. It had helped him to think of her as Colleen. The woman opened her mouth to answer when Michael heard a door open behind him. He automatically turned and then felt something akin to a kick in his stomach as he came face-to-face with his quarry. Collie came to an abrupt stop when she saw him, her gray eyes widening and her face flushing as recognition slammed into her. For a moment all Michael could do was stare. Gone was Colleen, the polished gallery manager with her dark red chignon, and in her place was the Collie of old, neatly dressed in her hotel uniform with a loose auburn braid falling over one shoulder and wispy tendrils softening the angles of her cheeks. This was his Collie. “Michael.” She took a half step backward, pressing a palm to her chest. He automatically lifted a hand, as if to stop her from turning and fleeing, felt the kid move behind him, and instantly lowered his arm. Michael swallowed. He couldn’t lie to her. “Garrett sent you.” It was an accusation he couldn’t deny, and he wasn’t going to try. The last words came out flatly, with no hint of the fiery emotion lighting her eyes. Dark gray eyes should be cold and steel-like, but Colleen Flanigan’s eyes were anything but. The tiny flecks in her irises were like small white-hot sparks, lighting the stormy depths. Garrett had wanted his fiancée to have a more polished name than Collie. He’d pointed out that Collie Hawley simply wouldn’t do, and Collie had agreed. However, Michael knew that Garrett had disliked her diminutive from day one, and after Collie had agreed to go by her given name, Garrett had teasingly told her that it was all for the best because a collie was a dog. Woof. Woof. And she hadn’t decked him. Testimony to how much she had changed since the days when she and Michael had studied together. “What do you want me to call you?” he asked. “If you’re here for the reason I think you’re here, I don’t want you to call me anything. I want you to leave.” Her voice was low and adamant and again he sensed that the kid behind him was about to take him out if he made a wrong move. “It’ll benefit both of us.” He left her to draw her own conclusion and, after a few tense seconds, her expression shifted, but not in the direction he wanted. No sudden acknowledgment that she was in a lose-lose situation and needed to negotiate her way out. No sign of “you got me, let’s talk.” None. He couldn’t say he was surprised. Collie took a step forward and pointed a finger at the middle of Michael’s chest. “We have nothing to talk about, Michael. Not. One. Thing. You go back to Hawley Enterprises and tell Garrett that I refused to talk to you.” She lifted her chin and, even though he had a good eight inches on her, he got the distinct impression that she was looking down at him. “I can’t believe you’ve come to do this.” Her voice shook a little, telling him that she was both angry and hurt. “Would you like help finding your way out?” the woman standing behind him asked in a no-nonsense voice. Michael turned, his attention instantly caught not by the small woman, but by the kid towering over her, a grim expression on his young face. “Uh…no.” But it was time for him to regroup, and he’d just as soon do it without the kid attempting to manhandle him up the stairs. Colleen leaned back against the heavy wood door of the backup storage room where she’d been searching for a case of new mop heads when she’d heard voices and stepped out to investigate, only to receive the shock of her life. She closed her eyes and pressed her lips tightly together. Even though she was certain Michael was gone, she still pressed against the door as if barring it against her former friend. Angelica was probably wondering why she’d turned and walked back into the small room at the same time Michael and Mateo had headed for the stairwell, but she’d needed a moment. More like an hour, and even that might not be enough. During her last conversation with Garrett before leaving Chicago for Marietta, she’d asked him to do the right thing and allow her to keep the ring that had once belonged to her family—the ring that meant so much to her grandmother, the woman who’d raised her after she’d lost her parents in a car crash. He’d flatly refused, explaining that his dad wanted to use the stone for his own engagement. Hugh Hawley Jr. was going to pry the stone from its original setting and put it in something more suited to his bride-to-be’s modern tastes. It hurt to even think about it. Collie swallowed and then pushed the hair back from her forehead with both hands as she fought to get hold of herself. The gig was up. The Hawleys were coming after the stone, as she’d known they would. This day had been inevitable, but she hadn’t expected Michael to be part of it. The Michael she’d known and cared for wouldn’t have been a part of it. She tilted her head back and blinked back tears, which was crazy. She and Michael hadn’t been close for a while now, not since she’d become engaged. He’d kissed her cheek after the announcement—his lips cool against her skin—wished her well and then, for all intents and purposes, removed himself from her life. Her trusted friend and study partner—gone. She’d made a few overtures. Asked him to coffee and out for drinks, but he’d gently turned her down and eventually she’d gotten the message. Their relationship had ended when she’d become engaged to his boss. It’d been hard to accept, but looking back, it’d had to be that way. Garrett wouldn’t have allowed his wife to have a male best friend. People might talk, which was a stupid concern, but Garrett spent a lot of time worrying about public image. She hadn’t recognized that small fact—and a lot of other stuff—in the beginning, when she’d been head over heels for the guy. Because she’d chosen Garrett, Michael had no choice but to step aside. But he could have given you a little closure—right? He hadn’t. What really fried her was that after her engagement, when they met at the Hawley Enterprises offices, which were in the same building as the gallery she managed, he’d called her Colleen. She’d hated it. She should have never been Colleen to him after all the time they’d spent together, but she was. Yeah, they did. And sometimes forever. After she called off the wedding, she’d hoped to hear from Michael, but he continued to keep his distance—no ‘I told you so,’ no ‘hey, want to talk?’ It wasn’t hard to figure out why. Garrett wouldn’t be happy with Michael picking up their friendship, and Michael still had to work closely with the man. He’d made a commitment to the company—signed a five-year contract in return for forgiveness of the healthy financial debt he’d incurred with his graduate studies. Yes, Michael had reason to keep his distance, but it still stung. Well, he was back now, and it wasn’t to pick up the friendship. He’d come on a mission from Garrett, and the fact that he’d come on a mission not only hurt, it annoyed her as well. Right now, she was focusing on annoyance, because it felt better than hurt. Collie wiped her eyes with the back of her hand, then took a chance and cracked the door open. As she expected, the hall was clear. Time to face Angelica, thank her and explain, then get herself upstairs for her meeting with Walker Wilder, the events coordinator for the hotel, who probably wanted to talk about decorating the ballroom for the St. Patrick’s Day Dinner Dance. As soon as she stepped out into the hall, Angelica did the same, waiting near the door of the staff break room as Collie walked down the narrow limestone-walled hallway. “This isn’t a secret.” And Collie wasn’t going to treat it as such. Now that Garrett had chased her down, the more people who knew the truth, the better. “I was engaged to a wealthy man and, due to circumstances, after we broke our engagement, I kept the ring. He wants it back. He sent his henchman to get it.” Okay—that was a little dramatic. Which was a very good reason to keep the ring, but not Collie’s reason. “No.” He’d charmed and controlled and manipulated and reshaped her until Collie had barely recognized herself, but he hadn’t cheated. “Yet you agreed to marry him?” Angelica’s eyebrows were approaching her hairline. Now she looked up and down the hallway, perhaps wanting to hear the story quickly before Mateo came back. “I thought I loved him.” ‘Thought’ being the key word. The Garrett she’d fallen for had turned out to be a mirage. A front. The face he showed the world. It had felt very real in the beginning, until his grandfather had died, and his father had taken a more active part in the business. 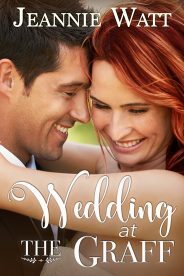 That was when the front began to slip and Collie started getting a taste of what her life was going to be like as Mrs. Colleen Hawley. That was when she began to wonder about the depth of the mistake she’d made. “It seemed kind of poetic.” And fortuitous. She’d heard that Mrs. Blaisdell had purchased a fishing lodge in the area and contacted her about work. She’d come to find out the fishing lodge was a dilapidated mess, and that had started Collie thinking about possibilities. Like starting her own cleaning and restoration business. If all worked out, Mrs. B would be her first client and she would grow her business from there. And in the meantime, she was very happy at the Graff. Because she was not giving back the Flanigan Stone. It would kill her grandmother if she did. After Mateo followed Michael up the stairs from the basement, staying a polite distance behind him, he planted himself near the door of the stairwell. “I’m not going back down,” Michael said. “We were friends.” He was there because of that friendship but foresaw some difficulty in convincing Collie of that fact. The kid gave a ‘whatever’ shrug and maintained his position by the door as Michael started across the lobby to the front desk. He hadn’t expected that getting the ring back would be a slam dunk, but he’d thought Collie would see the benefit of discussing the situation with him. She had to be aware that Garrett was being hassled by his father, and now that Hugh Jr. wanted to give the emerald to his new wife-to-be, there was no way Collie was going to win this battle. Through sheer stubbornness, she could drag things out, but the Hawleys would start playing rough if she didn’t give in. “Did your friend talk you into staying?” the deskman asked as his fingers tapped away on the keyboard. “In a manner of speaking.” Michael pulled his wallet from his rear pocket. “Oh, no,” Michael said quickly. Maybe too quickly, judging by the curious look Bob gave him. “I, uh, don’t want any special treatment. Just being here in Marietta is special enough.” He was not going to cash in on Collie’s name to get an upgrade. “Perfect.” Michael handed over his ID and credit card and a few minutes later Bob passed a keycard across the counter. “Thanks.” He thought about asking Bob not to tell Collie he’d checked in but decided to let things play out. She was the one with something to lose. He would simply be on the receiving end of one of Garrett’s moods when he returned, unlike Collie who was likely to be either sued or charged with a crime—whichever Garrett’s lawyer saw as the better tactic. Collie still felt shaky when she caught up with Walker in the ballroom, where the events director was studying the tall windows as if visualizing how they’d be transformed after the staff decorated for the St. Patrick’s Day fundraising dinner dance the following day. “Angelica’s good that way.” The entire staff worked together for the benefit of the hotel, which made the Graff a pleasant place to work. Walker motioned to a bare table with a leather portfolio sitting on it, and Collie took a seat on one of the wooden chairs. A wonderful change in Collie’s opinion. “Sometimes life throws you a curve ball,” she said matter-of-factly. Sometimes you needed to leave town to escape your past, only to have your past catch up with you, which was exactly what had happened to her today. “Oh.” Collie didn’t know what else to say. Walker opened the portfolio and pulled out a folder labeled Mason-Travois. Collie got to her feet and started for the tall double doors, even though she was reluctant to leave the ballroom and quite possibly run into Michael again. She fully intended to talk to the man if he hung around town, but she was going to do it on her terms at a time she chose. That time was not now. Did you know that Wedding at the Graff and many titles are available digitally from Tule's own bookstore? Check it out!